Even with the robust ad and subscriber revenue growth forecast through 2020, Hulu will likely still be making a loss three years from today. That said, it still provides important value to Disney. eMarketer forecasts strong growth for Hulu ad revenue through 2020. The company says Hulu will increase ad revenue from $1 billion in 2017 to $1.4 billion in 2020. However, ad revenue is only one dimension of the Hulu revenue picture. Unlike its bigger rivals Netflix and Amazon Prime Video, Hulu has a dual revenue model: ads and subscription revenue. 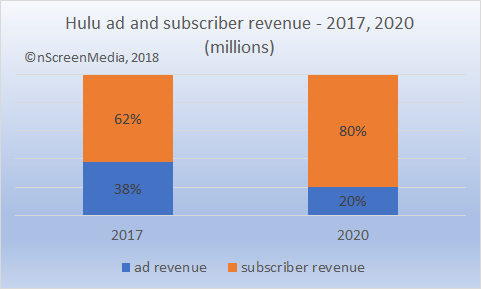 It turns out, subscriptions drive far more revenue than ads, and the importance of ads is diminishing. As a private company, Hulu does not regularly report on its performance. However, it does provide irregular guidance on progress. In May of 2018, Hulu said it had reached 20 million subscribers, an increase of 3M from the end of 2017 and 8 million from April 2016. Unfortunately, the company has never been specific about the number of ad-free subscribers. Recently, company insiders have said the “vast majority” of people sign-up and watch ads. They have also said it’s about 50-50, between ad-free and ad-watching subscriber. I have estimated the population of ad-free viewers in 2017 at 15%. Hulu Live launched mid-2017. One year later, the company said it had acquired 800,000 subscribers. So, the contribution of Live to overall revenue in 2017 was likely very small. It increase prices in 2019. Hulu and ad-free Hulu will increase $1 and $1.5 respectively. Hulu Live will cost $9 more in 2020 to cope with persistent above-inflation TV license fee increases. The population opting for ad-free viewing will reach 40% in 2020. Will Hulu be profitable in 2020? Hulu is very unprofitable at the moment. The company reportedly lost $1 billion in 2017 and double Q1 2018 losses in Q2. It is on track to lose a further $1+ billion this year. The company will add $3 billion in annual revenue by 2020. However, a lot of that revenue growth will come from the 3 million Hulu Live subscribers. After accounting for TV license fees, nScreenMedia does not believe Hulu will make any money from Live customers. If it stays on the current course, we believe it is very unlikely Hulu will be able to wipe out losses by 2020. Of course, under Disney control, it may change course. Moreover, notwithstanding the losses, there is still value in Hulu for Disney. It provides an important bridge for viewers to the direct-to-consumer future for which Disney is planning. Hulu is projected to grow ad revenue 40% by 2020. However, subscriptions remain the main revenue and growth driver for the company. By 2020, the company will still be making a loss, but it will provide additional value to Disney which will likely make it a valuable investment.